Here is the first of the Revell boxes, all of kits are good, the artwork is nice, and the cars are from the very best period for US iron. Sadly I have not yet managed to get hold of one of these. 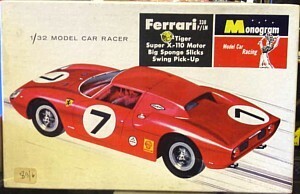 This model has been re-re-re-released just a few years ago, if you can, get one. All of those kits are great, lots of details quite accurate and 1/32nd. Strangely no glass was supplied, you had to use flat sheet (supplied) and cut your own. Put it toghether with the Gunze kits,and you have all the spectacular Cadillacs you could want. Kit & picture from Mike Sells. 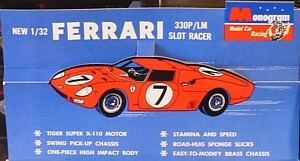 The Airfix Ferrari 250 LM, a nice box, but sadly the kit itself is not very good, I am not too sure why they keep re-releasing it, instead of some of the kits we all want like the Jaguar 420. Found in Maidstone after years of lusting after one of these. 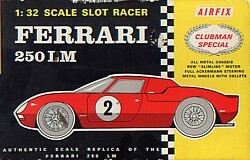 as a Ferrari collector, I had to have the Monogram 250 LM. Sadly they are very rare and hard to get. This one was unused, available at a good price and came with the box and insert. It is one of the later Monogram kits, and the artwork is a little bland. Still, I was glad to find it. Kit and picture from Joel Thura who snatched it from under the nose of David Lawson.